I've actually only ever had real french toast once. But on occasion I make my own protein french toast. It's an easy, quick breakfast that makes a nice change every once and a while. You can top it with a variety of toppings and use another flavoured protein for a different flavour. 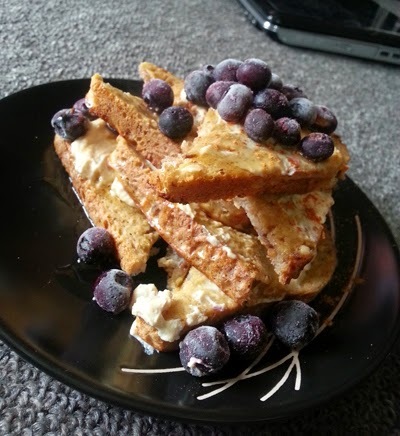 In the image below I topped it with blueberries, maple syrup, and a mixture of greek yoghurt, peanut flour, and stevia. Mix together protein powder, egg, and cinnamon in a wide bowl. Lay first piece of toast in the mixture and coat both sides, repeat with second slice. Place slices onto a lined baking tray and bake in the oven for about 10 minutes until they are slightly crispy and toast it cooked. Drizzle over your toppings and fruit. You may want to add stevia to the mixture if you prefer it sweeter. If you don't like eating the egg yolk, you could use two egg whites instead.